The first SA-China Capital Market Forum was launched in Johannesburg on Thursday with the aim of increasing investment flow between the two countries. “Today, we are here to further strengthen our relationship. I hope that this forum will lead to productive collaboration between the JSE [Johannesburg Stock Exchange] and the SSE [Shanghai Stock Exchange],” the Chairman of the JSE Humphrey Borkum said at the launch. Deputy Governor of the South African Reserve Bank Daniel Mminele said the South African economy would benefit from Chinese expertise and cooperation. “In the spirit of collaboration of the BRICS alliance, to which both China and South Africa belong, it is fitting for us to support each other’s economic progress,” said Mminele. China’s trade with South Africa last year reached $60 billion. Chinese investment has risen to approximately $101 billion in commercial projects across the African continent since 2010. The JSE and the SSE signed a Memorandum of Understanding last year to further boost trade ties. As bilateral trade grows between the two countries, the renminbi (RMB) is expected to be more widely used as settlement currency, said Qiu Zhikun, General Manager of the Johannesburg branch of the Bank of China at the forum. The Bank of China has opened more than 1,000 offshore RMB clearing bank accounts in more than 80 countries over the last four years. 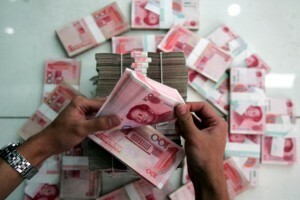 Experts have said RMB trade could make sufficient inroads in Africa. General Manager of Bonds and Financial Derivatives at the JSE, Warren Geers, said his agency had already launched rand-RMB exchange hedging derivatives and trade volume has grown considerably. Ross Meredith, Head of Foreign Exchange Sales at Africa’s fourth largest bank, Nedbank, said South Africa handled 18 per cent of all RMB settlement business in Africa in 2011. South Africa’s Nedbank and the Bank of China signed a strategic business cooperation agreement earlier this week to grow business flows between China and Africa, as well as provide support to investors. The comment Mr Meredith from Nedbank made was that in the period between October 2010 to January 2013, 87% of RMB settlements between Africa and China were related to South Africa.